Balancing working/show condition during the Summer months. We are now in the height of the Summer Working test/Show season. Each weekend brings either one or the other with some weekends bringing both. Keeping condition on dogs at this point in the season is one of the most challenging things , I find, for a dog doing both disciplines. The early months of roadwork and sea swimming have laid down a solid base of condition and now its simply a matter of maintenence. The rigours of training, however, can take its toll on a dog and if not watched for carefully can leave them too ‘light’ for the show ring. It is important that condition is not mistaken for simply adding weight, something which should never occur in an active working gundog.Personally, I find the most effective way of keeping and holding condition is to increase protein percentage in their food without increasing volume. I also like to add plenty of oil in their food to keep skin and coat in peak condition. This system seems to work for me as, so far, none of my dogs have broken down through injury either through hunting season or the Summer circuit. My plans for the boys , Bertie and Mossy are progressing as outlined earlier in the year. I removed Mossy from the show ring in Ireland , for this season,to concentrate on his gundog training and am campaigning Bertie in the ring .At present Bertie has three green stars from three shows towards his show champion title. He will need another four to complete which I expect him to achieve before the start of shooting season..
Mossy has competed in two working tests and has been unlucky not to be in the ribbons. Competition is so tight at prelim and novice levels that it takes a near faultless performance to finish in the top four and at the moment he needs tidying up on his presentation. The next two weeks will be extremely busy. Another working test to attend this coming weekend then final preparations for our next trip to the UK. 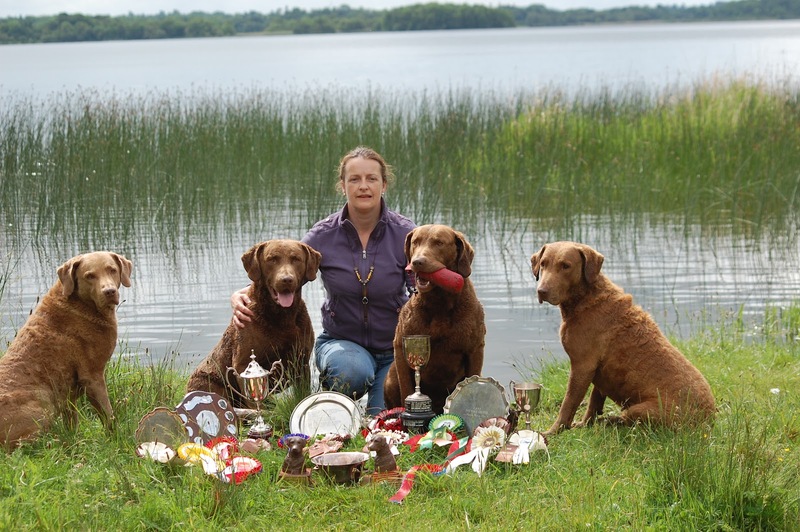 This time to compete at East of England champ show on Saturday and the Chesapeake Bay Retriever Club Champ show on the Sunday. We will be travelling with four chessies and puppy. Chester is returning to the showring following a spell in semi retirement. He will be competing at East of England and the Club show with plans to return in August to attend Welsh kennel Club. After an intensive morning training, last Sunday , on Lough Ennell I thought it would be nice to take a photo of some of the silverware and rossettes which they have gathered in the last year. This entry was tagged animals, dogs, working gundogs, writing. Bookmark the permalink.